A premium new cooler bag that has a heather style fabric and a large capacity. Introducing the new premium addition to our cooler bag collection. These bags have an exceptional 18L capacity and feature a "heather style" with a fashionable two tone look. They utilise a PE foam insulation encased in a waterproof PEVA inner liner to keep all of your food and drink cool for as long as possible. 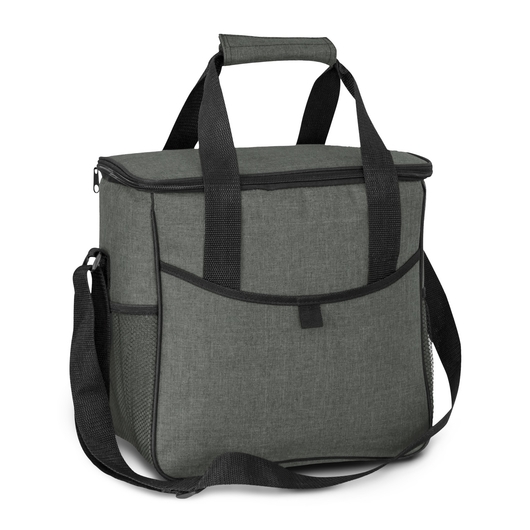 The outer construction is made from poly-canvas and other features of the bag include: a zippered top closure, a large front slip pocket, 2 mesh side pockets, woven carry handles with velcro cuff and an adjustable shoulder strap for easy transportation. The perfect cooler bag for the beach, picnics and park!